Informed For Life does not accept donations, funding, or advertisements, from any individual or organization. Provide a free, public service to guide consumers on the use of vehicle crash test ratings and fatality data—to save lives. Since 2003 InformedForLife.org has helped over 1/2 million visitors find the safest vehicles! On a typical day in the U.S. there are 17,000 motor vehicle accidents, injuring 7,000 people and killing 102. Choose your vehicle as though your life depends on it! 2. ► Go directly to the listing of the safest one percent of vehicles. These vehicles meet more stringent safety criteria than IIHS and NHTSA combined! Click the down arrows▼next to Year▼, Make▼, Model▼, Style▼and then press GO to see the safety evaluation for your vehicle. 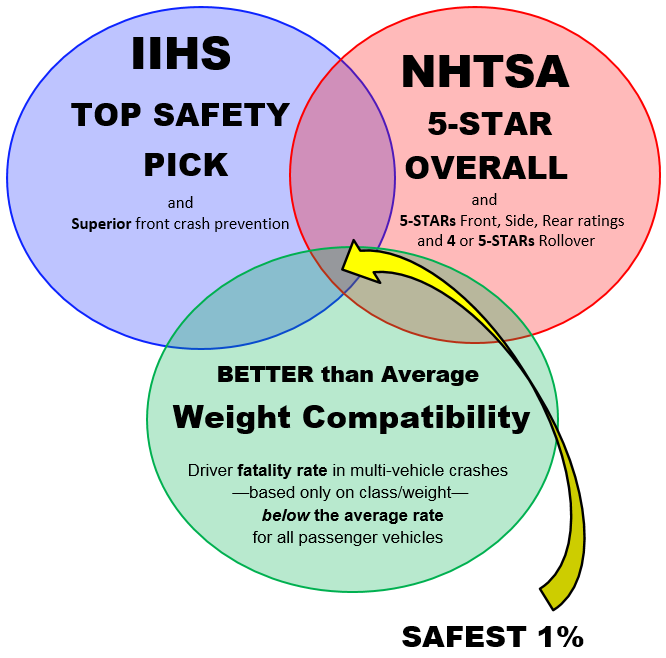 The safest vehicles have BETTER THAN AVERAGE WEIGHT COMPATIBILITY**, are rated 5-STARS OVERALL by NHTSA, and meet TOP SAFETY PICK criteria by IIHS. They also have a NHTSA side-impact rating of 5-Stars, a rollover rating of at least 4-Stars, and a front crash prevention system rated Superior by IIHS. 6718 vehicles have been evaluated for model-years 2011–2019: 1% meet SAFEST criteria; 18% have REDUCED SAFETY; 37% are LEAST SAFE; 45% have INDETERMINATE SAFETY.* . B.) LEAST SAFE: any crash rating in the bottom quartile and/or NHTSA static rollover risk 1/2/3–Stars (which is above the average risk for an SUV class vehicle) and/or multi-vehicle crash factor above 1.20 (driver fatality rate based on class/weight is at least 20 percent higher than the rate for the average passenger vehicle). Note: A vehicle is not classified as least safe if its only deficiencies are IIHS frontal crash prevention system score and headlamp performance rating. C.) REDUCED SAFETY: a vehicle that is not LEAST SAFE but has a least one crash rating between the top and bottom quartiles and/or multi-vehicle crash factor between 1.00–1.20 and/or IIHS frontal crash prevention system score less than 5 and/or IIHS headlamp performance rated poor. D.) SAFETY INDETERMINATE: any rating unknown, however, all known ratings meet the safest criteria. 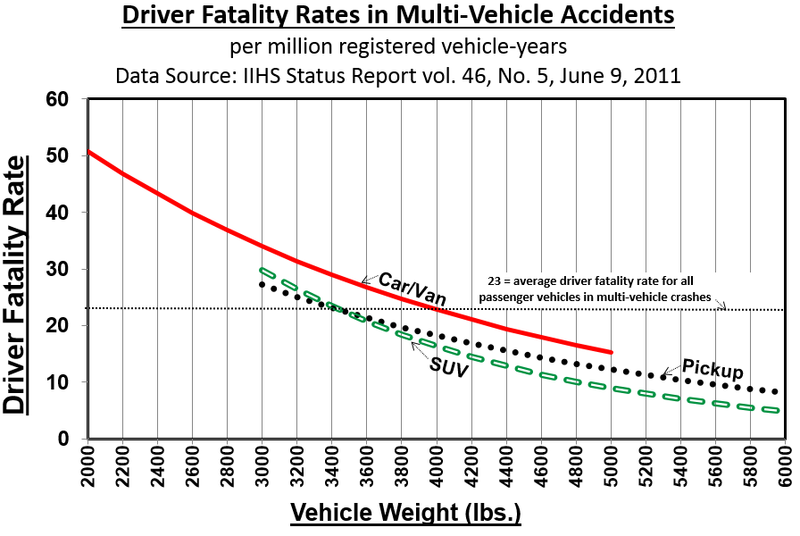 ** The MULTI-VEHICLE CRASH Factor is the ratio of the driver fatality rate for a vehicle based solely on its class and weight versus the average driver fatality rate for all passenger vehicles in multi-vehicle crashes (23 deaths per million registered vehicle-years). It is a measure of vehicle compatibility. The relative weight of a vehicle compared with one it collides with in a head-on crash is a critical determinant of the forces the occupants are subjected to, however, neither size or weight are evaluated in crash test ratings and must be assessed separately. **** Some vehicles offer multiple headlamps versions, depending on trim package and/or optional equipment and may perform differently than those rated above. Every effort has been made to be accurate and objective, however all information is subject to errors and omissions.